I decided to take a look at the Tk GUI framework for Python and put together a simple mockup GUI to test various things. I'd worked with Tk before in Perl (see my Perl CyanChat Client) and if you look at some of the Linux screenshots on that page, Tk looks ugly as hell in Perl. Python's implementation of Tk (which they call Tkinter) is more modern than Perl's, and there's other neat helper modules like ttk which provides the Tk "Tile" theming engine which makes the standard Tk widgets look more modern, and takes a CSS-style approach to theming your widgets: instead of manually specifying things like background and foreground colors in each widget you program, you keep all that stuff in one central place and refer to it by name from the widgets. 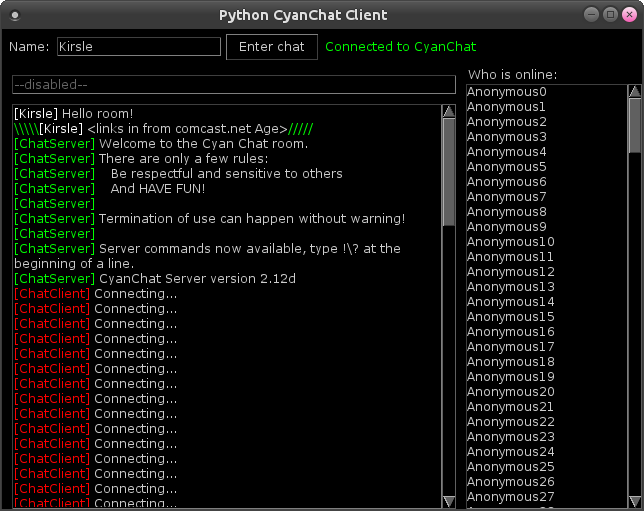 For my Python mockup test app, I put together a rough copy of my Perl CyanChat Client GUI. At first I was trying to use the ttk/Tile versions of the widgets (such as Button, Entry, etc. ), but I ran into a rather annoying roadblock: in PCCC, my text Entry widgets have black background colors, and the insertion cursor (the little flashing I-beam in a text box) is also black by default. So when clicking in the text box, you wouldn't be able to see the insertion cursor. In the standard Tkinter Entry widget, you can use the insertbackground option to change the color of the insertion cursor. But in ttk/Tile? There is no insertbackground option. Source - it's just not supported in ttk/Tile and their theming engine. Except for those ugly scrollbars. The "1980s 3D" look to the scrollbar and those ugly triangle arrow widgets are from the Motif GUI which Tk was originally modeled to look like. It's ancient and it's ugly. This was also one of the main reasons why my Perl CyanChat Client looks so horrible under Linux, because this is Tk and Tk is ancient. The Tile theming engine is supposed to fix this, but I wasn't using Tile in my code because of the aforementioned text insertion cursor problem. The best I could do with the standard Tk scrollbar is color it to make it look kind of "cool" at least, so I made it all black and grey to fit the theme of the rest of my GUI. But then I figured out I can mix and match the widgets. I could import the Scrollbar from ttk while importing all the other widgets from Tkinter. The result? 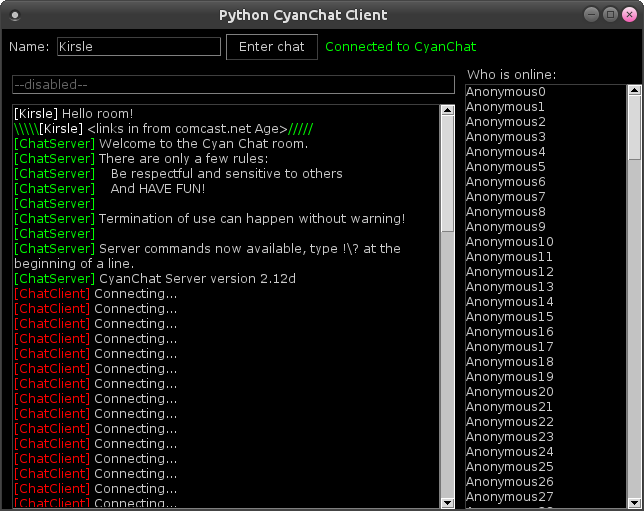 I probably won't create a full CyanChat client in Python because I really don't care about CyanChat much anymore, so this was mostly just me messing around with Tk and seeing how practical it is for certain use cases. But here's the source code anyway. There's a few interesting things in the code, like I created my own "Scrolled" class for wrapping a widget in a scrollbar (works with Text and Listbox), so it's kinda like Python's ScrolledText module, but it's really more like Perl's Tk::Scrolled module in that it can wrap arbitrary widgets, not just Text. Also, Tkinter's Text widget can't be made read-only. You can make a text box disabled, but that also prevents programmatic insertions/deletions as well. So I made a little function for inserting text that would first re-enable it, then insert text, then disable it again. """My test script for Python/Tk experimentation.""" """Insert text into a readonly (disabled) widget.""" """Simple Python class to hold style-related configurations for widgets.""" # scrollbar, use ttk's theming system instead. Tk::Scrolled in that it can wrap any widget, in theory.""" """Get at the inner widget.""" """Get at the scrollbar widget.""" """Wrapper so that pack() works as you'd expect.""" """Resize a window and center it on the screen."""